Pip Evans, director of NV Integration, gives Ce Pro Europe the tour of this very special project that combines entertainment with the latest and greatest in automation. 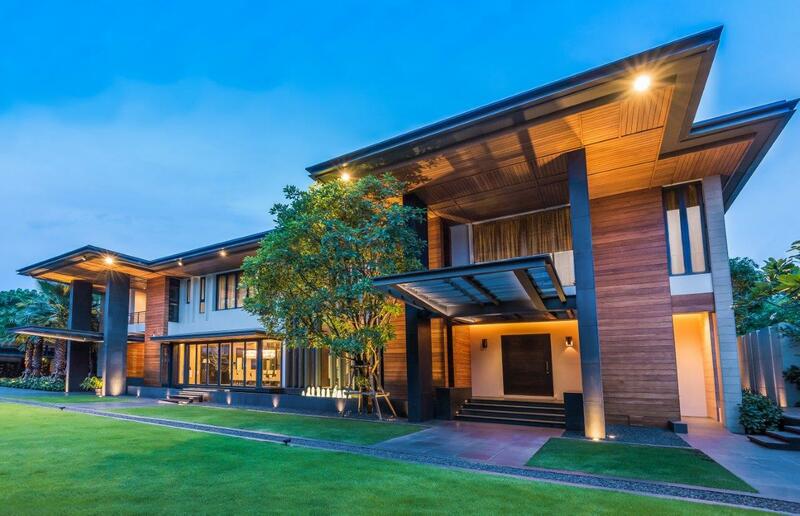 The challenge was to provide a home packed full of entertainment at this luxurious Bangkok party house. 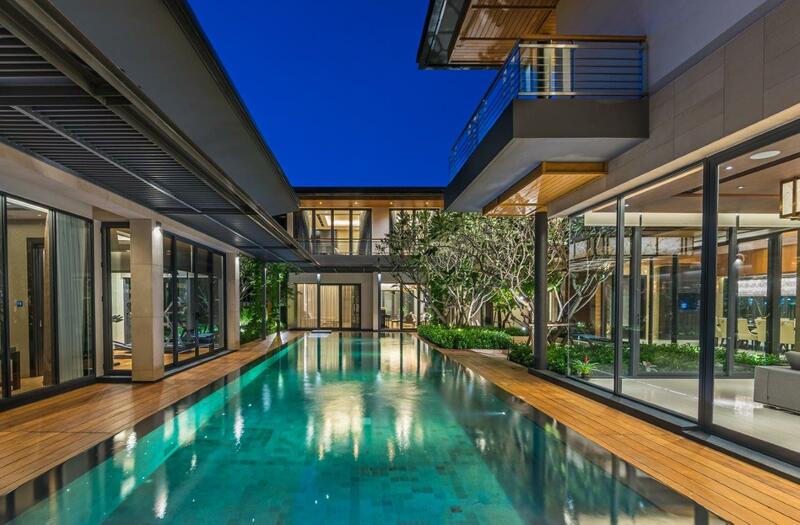 One of the things that immediately hits home about this property is the sheer size (3,000sqm) and level of bespoke automation that was needed to fulfil the brief. 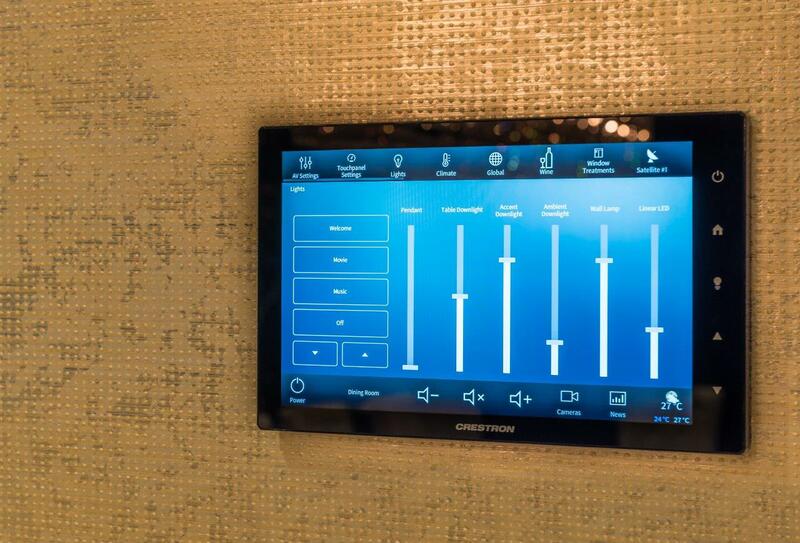 The team chose Crestron as the platform built around a CP3 smart home processor. So how did this London based installer land a job on the other side of the planet? 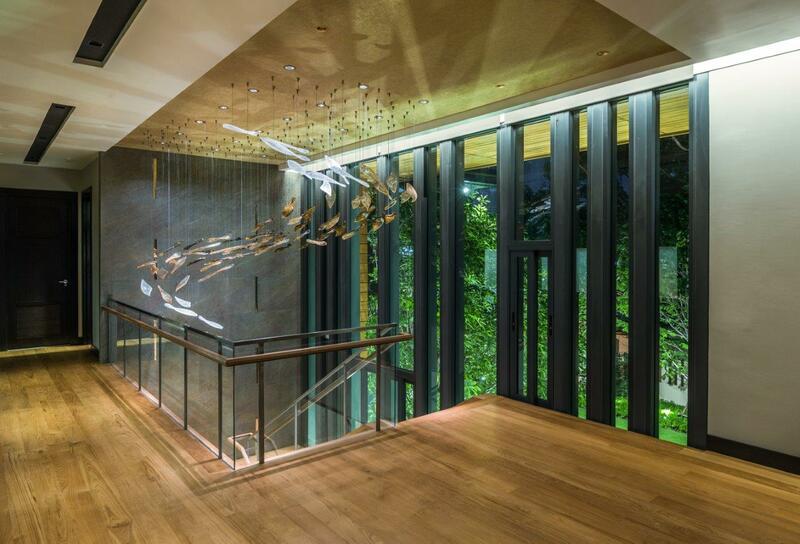 Pip explains, “The client is called Anurit Kerdsinchai who is a successful industrialist and philanthropist. He is a real anglophile and was in London on the Kings Road buying a kitchen. 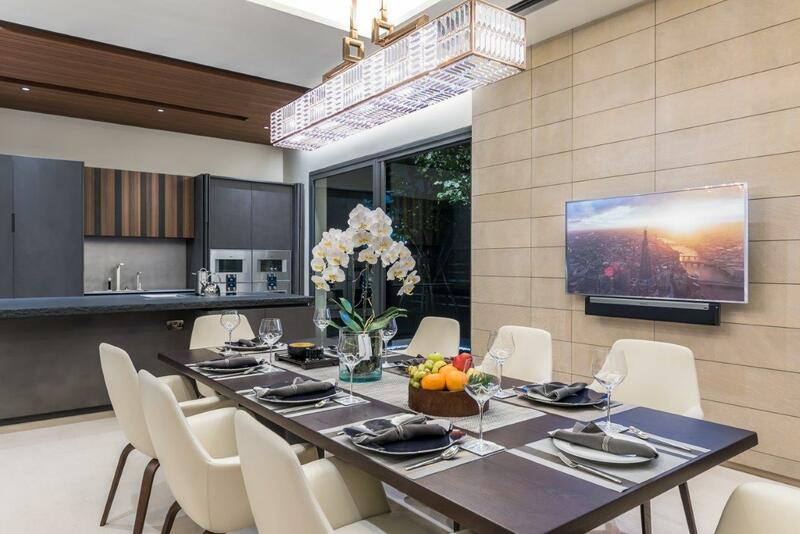 He asked the kitchen supplier if he knew anyone in our sector and was referred our way, ten munities later he was in our showroom saying he was in the market for a home automation system. 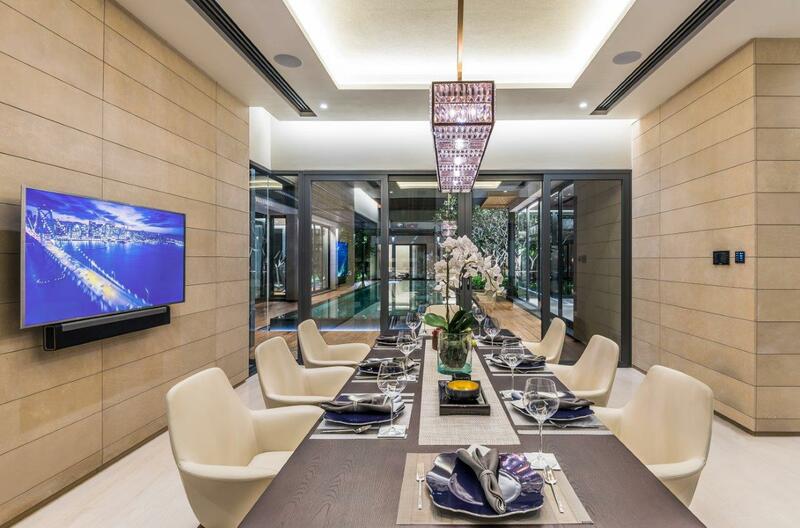 The house is situated to the east of the city centre and is spread over 3,000sqm including five bedrooms, a living room, a dining room, wine cellar and a home theatre. 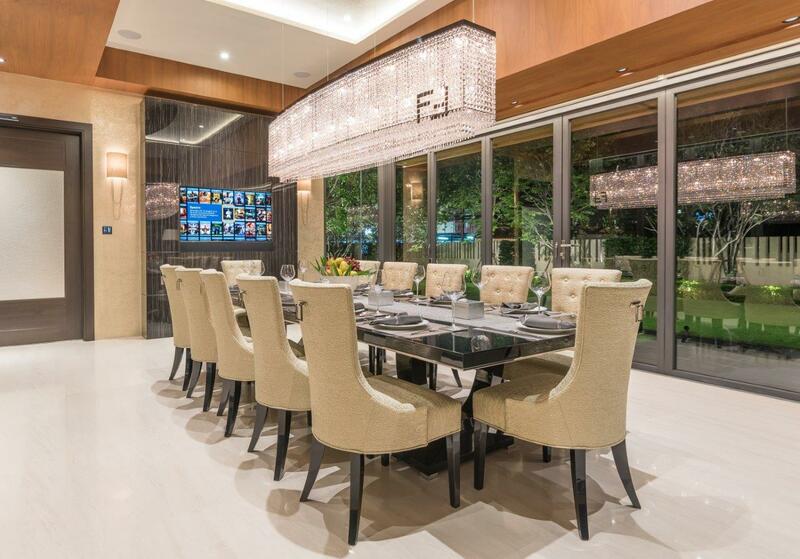 Not compromising the style of the interior was important, so in the living room, dining room and master bedroom integrated TVs hide behind moving panels supplied by Future Automation. 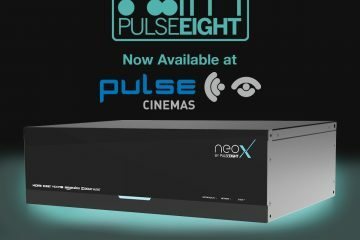 As well as using a Crestron CP3 processor to manage and integrate, NV Integration also specified Crestron’s multi-room music system Sonnex Audio connected with Tidal and Spotify. A Crestron DigitalMedia (DM) 4K 16×16 switcher centralises and distributes the video content and DM also helped overcome several potential challenges, including the length of cable runs and incongruent video signals, providing the switching and HD signal distribution. 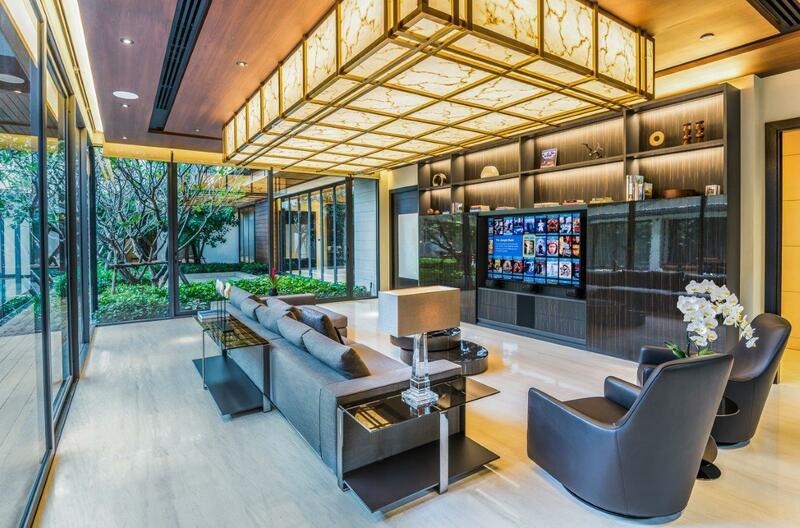 Bespoke interfaces are a big part of what makes the project special controlling the AV, lighting, security and AV via Crestron TSW-752 and TSW-1052 wall-mounted touch screens. 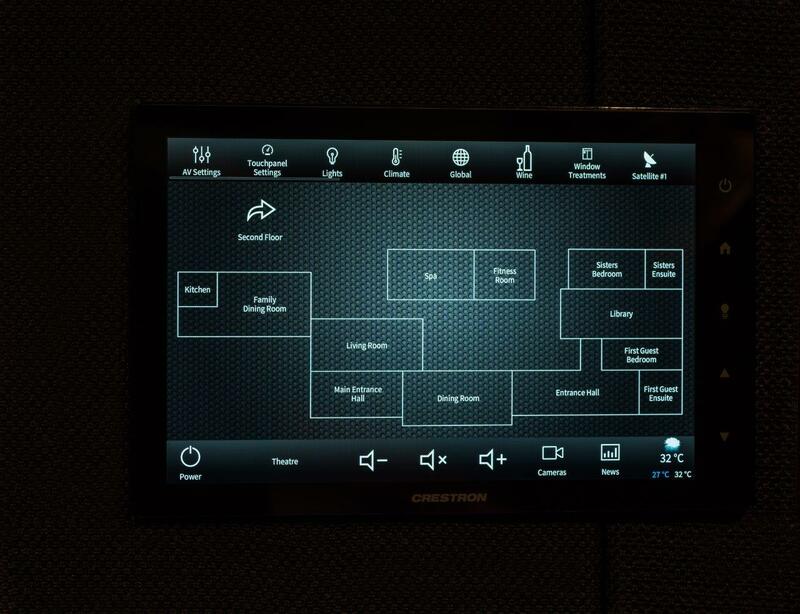 TSR-302 touchscreen remotes in two of the bedrooms complete the control package. For the owner to have their desired party experience at the touch of a button, a variety of pre-programmed scenes can be selected on the bespoke interface. 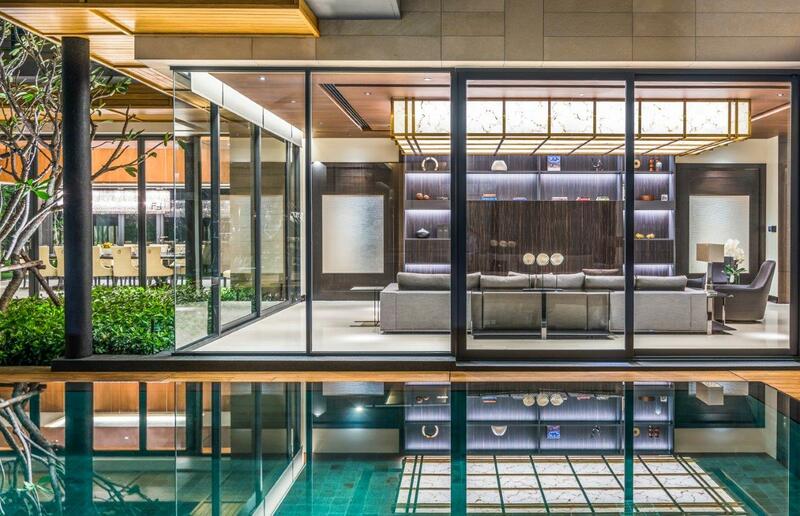 When the owner selects the much-used ‘whole house-party mode’, custom features automatically activate external lighting scenes, turn the carp pond fountains on, select a ‘discover weekly’ playlist on Spotify for the garden and ground floor speakers, adjusts blinds and curtains and turns on the internal party lighting. 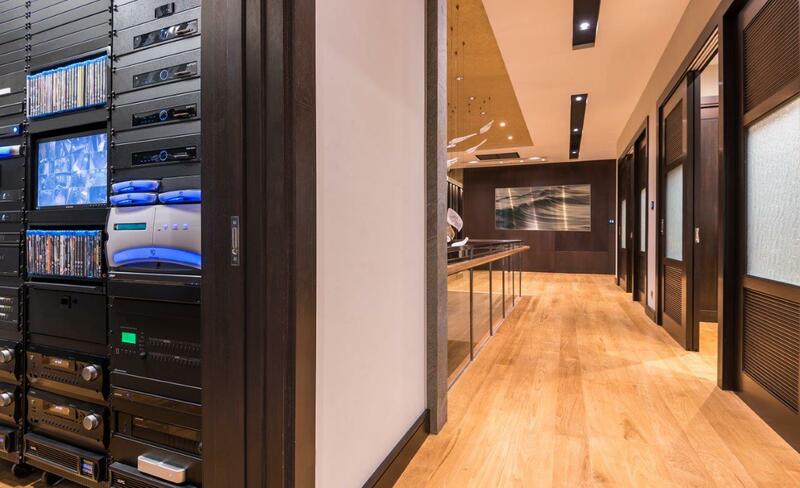 Pip and the team are particularly pleased with the integration and bespoke control between the Crestron interface and the wine cellar. Anurit can keep track of his whole collection of wines, keep stock controlled and get loads of information on what is being drunk, all from the bespoke GUI. The system also provides floor-plan layouts of each floor with feedback as to room status and what systems are running. 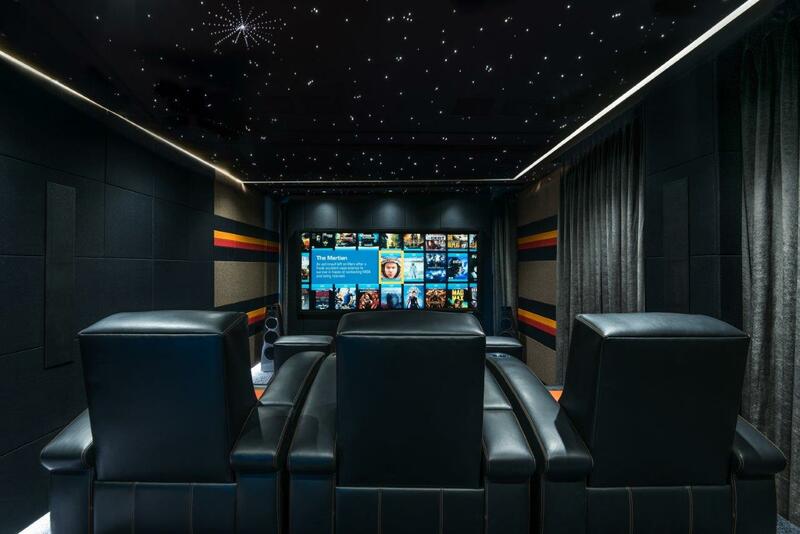 As entertainment is such a big factor on the house, it’s no surprise that Kaleidescape is delivered to four zones, security is also important to the client so 16 CCTV cameras keep an eye on what is going on. 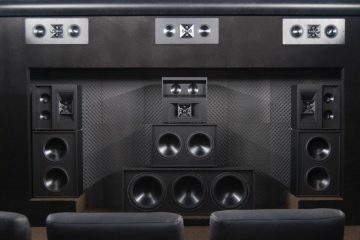 Bowers and Wilkins speakers are the weapons of choice to deliver the Sonnex system and there are also Artcoustic customised soundbars under some of the TVs. 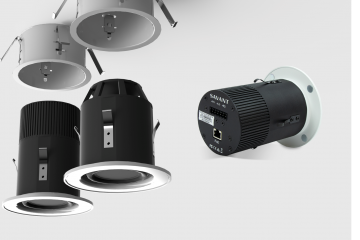 There are also two zones of Sonance’s exterior solution Sonarray in the grounds, which Pip says sound awesome, a welcome opportunity as much of the company’s work is in London where exterior spaces are in scarce supply. 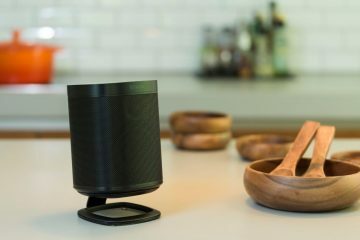 The team is also keen on the calibration available here as the amplification can be told exactly which speakers are being driven. Rounding out the AV, there are a few Sonos Playbars under some of the TVs just for a boost to the TV audio. 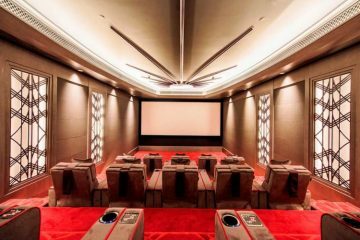 The cinema aspect of the project we know well here as it won the Best Cinema Project gong at the Smart Building Awards in 2017. 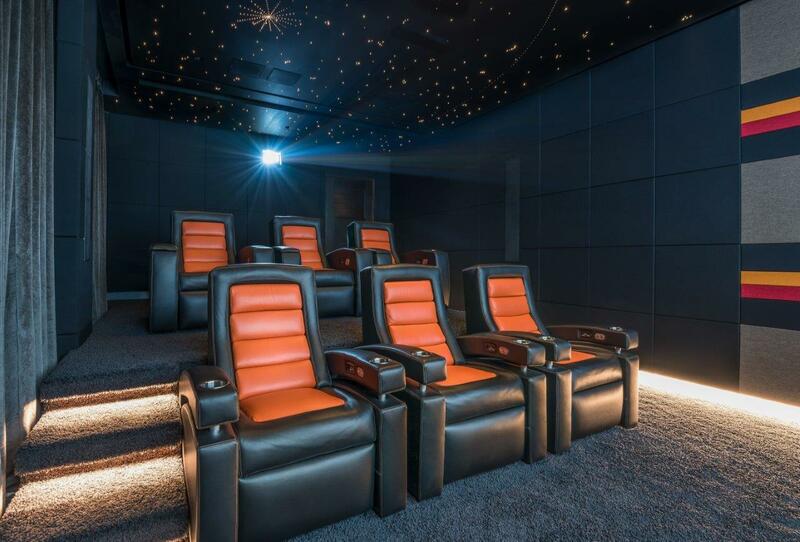 Meridian DSP Special Edition speakers deliver the provide the 9.4 audio set up, Fortress home theatre seats with D-Box are included, as is JVC projection, a 3.3 metre cinemascope Screen Research screen and a Kaleidescape Premier Line server delivering content. One of the main challenges of course was the distance and the travelling. Pip explains, “Shipping all of the equipment was relatively straight-forward, however it did involve long periods away from home for a lot of the team. The longest stay for one team member was four months, personally I made 16 trips in 18 months, all the travelling and jet lag does take a toll. 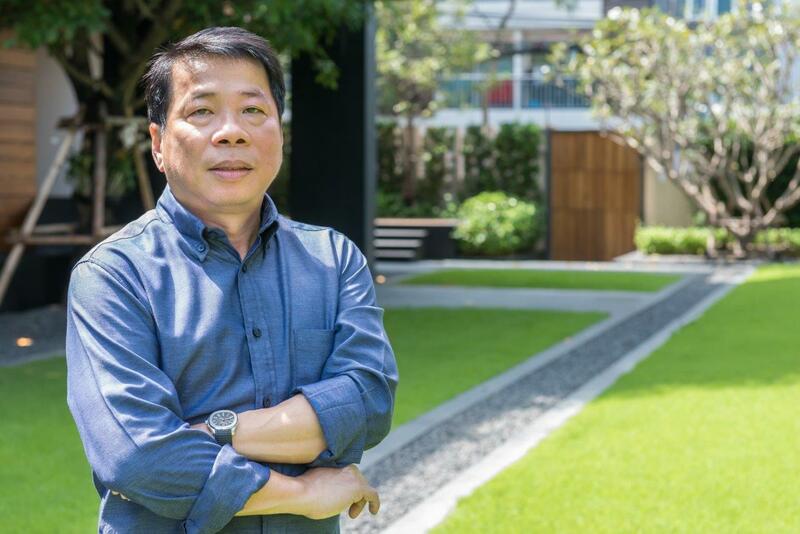 However, Anurit is so pleased with his party pad, that NV is also doing a significant commercial office project also in Bangkok for him which also includes a penthouse mirroring quite a few of the systems in the main house. 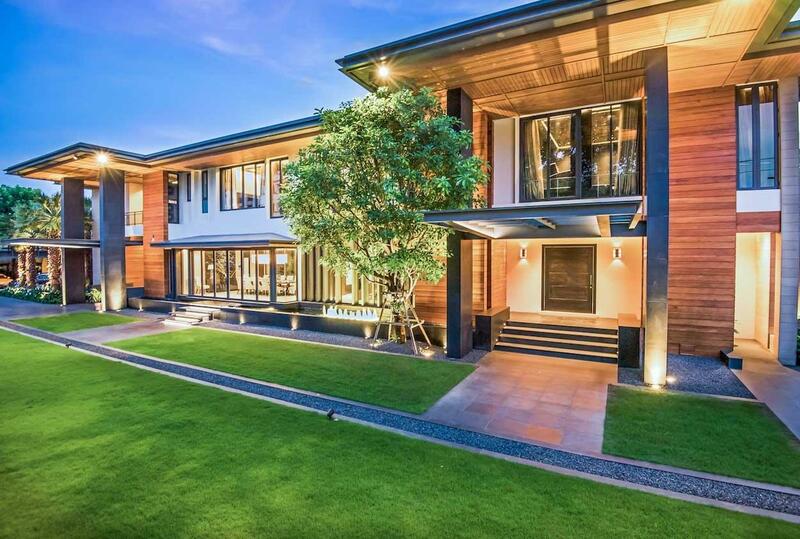 So, more flights and more heat await, but when the projects turn out this well, all the effort is well worth it. This article first appeared in the pages of Essential Install Magazine.